Poor UNRAVELED. This was another series I just waited too long to finish and I totally lost steam with it. I ended up actually grabbing the audiobook for this to make some progress and finally finish out this series but I just couldn’t quite get into it. I also do feel like a good book is still a good book and even though I took a long time to read UNRAVELED, that wasn’t the only issue. I really wasn’t able to fall back into it and this book really lost the familiarity for me. I felt like the characters had changed — which isn’t a bad thing at all — but I did miss the banter and sarcasm that I felt was much more prevalent in the first two books. I also had a bit of trouble with the fact that there were some things that popped up in this book that I don’t remember at all from CREWEL or UNALTERED. Yes, they were things that would have popped up later in the series and especially in a conclusion but I love when authors are able to layer their books/series so things so huge and series-changing at least have a small mention before they alter the entire course of a book. I did struggle with a few things like that with UNRAVELED and I just wish there was at least some mention of some of these really large concepts before they came into play. I was actually fairly disappointed with the ending. I suppose it’s more of a personal preference but the way that everything played out seemed abrupt and unsatisfying. I was working on catching up to all of these major ideas and concepts and then once it was all over, it took a bit too long to wrap up. Without spoiling anything, it really there was one final question to answer and I just wasn’t happy with how it was answered and how long it took for the one final reveal. There were things that I enjoyed about the book while reading/listening but looking back on it now, I feel like I barely remember what happened and everything else was more of a memory of what I had read in CREWEL and ALTERED. Again, I think it was mostly the fact that I just took so long to finish this series. I think I could have been in a higher rating-range had I read it sooner but I also think it still wouldn’t have been a stellar finish for me no matter what. Adelice // Character Obsessions: Saving the world, love, family. I felt so disconnected from Adelice in this book. I just really felt like she lost all of her personality and although she still had that drive to save the world, I just couldn’t click with her at all here. I just really struggled. Kept Me Hooked On: Finishing series. I really am trying to catch up on some of the series that Just need to finish and soon! Left Me Wanting More: Connection. It just wasn’t there for me. Between waiting to finish, the characters, new concepts, slow pacing… This one just didn’t do it for me. I suppose if you’re read books one and two and enjoyed them, then it’s worth reading to finish up the trilogy. If you weren’t a fan of the first two, I don’t know if this one will convince you. This entry was posted in Books, Dystopian, Review, Sci-Fi, YA and tagged Books, Crewel, Crewel World, Dystopian, Gennifer Albin, Review, Sci-Fi, Science Fiction, Unaltered, Unraveled, YA, Young Adult on January 1, 2016 by Brittany. I’ve been re-reading The Lunar Chronicles in anticipation of WINTER’s release in November and I’m having the best time! (Pssst check out the Lunar Chronicles (Re)Read Along if you want to join in for WINTER!) I’m re-reading each book on audio and I’ll be reading WINTER in print when it comes out and it’s been so much fun reliving one of my favorite series! Since I’ve already done one formal review of CRESS back when I first read it, I’m switching things up a bit with a bit more feeling and a little less analyzing with “10 Things I Felt About” CRESS! AMPED UP. I’ve been loving re-reading these books and I was so excited for the start of CRESS which was my favorite of the series after my original read. This book sure is action-packed and (once again) I forgot how much goes on! SYMPATHETIC. I remember Cress being naive but not in a bad way to where it could come off as annoying. I thought she was sheltered (naturally, given her situation) but she wasn’t AS naive as I thought she could have been which was awesome. It was enough to keep me sympathetic to her and not frazzled that she was so far behind in terms of life outside of the satellite! DISCONNECTED. The re-reads have become a bit weird for me and I’m not sure why. I want to blame the audios and that some of the voices are super different than how I pictured them in my head, including intonation and phrasing, but I can’t be 100% sure that it’s the audio’s fault. For some reason I felt a bit of a disconnect with the characters and I wasn’t AS invested as I was the first time around, which is really opposite for me and re-reads. THORNE-HUNGRY. I think I built it up so much in my head how much Thorne was in the series that I expected him to be in like… every scene haha! I just loved him so much that I wanted him to be a main character and while he is, he’s not AS important as characters like Cinder and Cress. He spends a lot of time with Cress and we see him on his own too but… well, I can’t get enough of him! I wanted more!! FEELING ALL THE FEELS. I adore the romance between Cress and Thorne in this book and how it develops and I really feel for Wolf throughout the book too. This was the book (in my first read) where I finally felt that connection between Cinder and Kai and it definitely sky rockets in CRESS! NERVOUS. This is the LAST THING before we read WINTER. I’m so nervous for how it ends!! HOOKED. One thing I really loved about CRESS was just how cinematic it is. It starts off with some awesome action and it really maintains a level of high-stakes excitement all the way throughout! SURPRISED. I really shouldn’t have been surprised at anything… but there was something in the middle that I totally forgot about and I did a little gasp! COMFORTABLE. I loved falling back into Cress’s story line in this book. I think it is my favorite because I love Cress (and her relationship with Thorne) and I really admire how much Cinder comes into her own in this book. She accepts some real responsibility and starts to really insert herself. RELIEVED. The audios for these books are great but to be honest, I’m kind of glad I’m reading WINTER in print. Rebecca Soler does a great job with Cinder, Cress, and pretty much all of the boys but I didn’t like her Scarlet and I couldn’t stand her Winter. I don’t know if I really want to listen to WINTER on audio (ever?) because I just don’t like her voice at all. It’s a close call whether CINDER or CRESS is my favorite of the series so far but I think CRESS takes the lead by a nose! It’s honestly so jam-packed full of action. 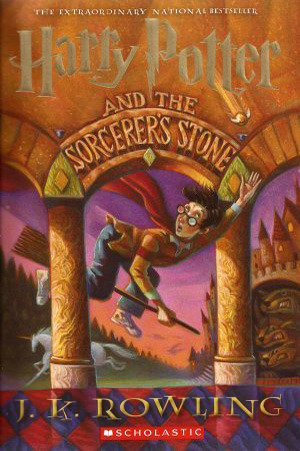 Even with a re-read I was totally hooked! This entry was posted in Books, Dystopian, Review, Sci-Fi, YA and tagged Books, Cinder, Dystopian, Fantasy, Marissa Meyer, Retelling, Retellings, Review, Scarlet, Sci-Fi, Science Fiction, The Lunar Chronicles, YA, Young Adult on October 31, 2015 by Brittany. I recently read NIGHTFALL (and hosted a Twitter chat with one of the authors, Peter Kujawinski) as a part of Penguin Teen’s WICKED READS campaign! I’m a huge fan of Halloween (as you’ve seen from the past two weeks of A Fortnight of Fright posts) so I was especially excited to join in on the Wicked Reads fun! A really big thanks to Penguin Teen for having me be a part of the Wicked Reads feature and hosting the Twitter chat!! It’s be a total blast so far and there’s still a lot more fun to come! Today I’m sharing my review for NIGHTFALL along with some other “Wicked Reads” that I enjoyed this Halloween season. Whether you’re reading to get in the Halloween spirit or just because you enjoy some scary books, these were all some really fun books that will put you in a horror or spooky mood so make a note if you’re looking for a few good recs! First things first, let’s get into the review of NIGHTFALL! I read NIGHTFALL for Penguin Teen’s Wicked Reads campaign and I’m really glad the timing for this worked out so well! I always enjoy a good, creepy read around Halloween (which I pretty much start reading for in September!) and NIGHTFALL was such a good creepy read for me because I’m a total chicken when it comes to horror. It was much more suspenseful with a little bit of horror and a whole lot of mystery so it made for an excellent selection for a scaredy cat like me! Right away, I was intrigued by the plot of the book. The concept of years of day and years of night is really neat and I was hooked from start to finish in anticipation of what really happens on this island at night. I thought the authors did a great job of keeping the readers interested by giving out enough clues but still keeping the questions open. I sped through the pages to try to get all of the answers because I just had to know what was going on! NIGHTFALL really reminded me of a mix of M. Night Shayamalan and The Giver Quartet by Lois Lowry. It had all of that great suspense that you find in Shayamalan movies and the setting and characters really reminded me of The Giver Quartet, specifically GATHERING BLUE and MESSENGER. The feel of The Giver Quartet did make the book feel a bit younger than the YA range I typically read (usually on the higher end of YA and I tend to read more adult than middle grade) so I did find myself a bit less connected to the characters than I had hoped because they felt a bit young. That really wasn’t a bad thing but more of a personal preference. I really did enjoy the character dynamics but they didn’t feel quite as developed or dynamic as I had hoped. The book was a really fun mix and I loved that it was one of those books that was so easy to explain in terms of feel. If you’re craving either one of those, NIGHTFALL is probably an excellent book to pick up next! NIGHTFALL was a quick and gripping read and I couldn’t turn the pages fast enough! The suspense was really great it was a fun read, especially for Halloween! It wasn’t totally the book for me but I thought it was well done and with just a bit more world-building and explanation, I think I could have really loved it! I love mood/seasonal reading for Halloween and it’s the one season I really read for every year! Here are some more of my favorite books that put me in a Halloween mood and some excellent “Wicked Reads”! Don’t miss Penguin Teen’s #TwitterGhostStory feature on Twitter! It’s a week-long event from Monday, October 26th to Saturday October 31st in which you can write a spooky story in 140 characters or less using #TwitterGhostStory! 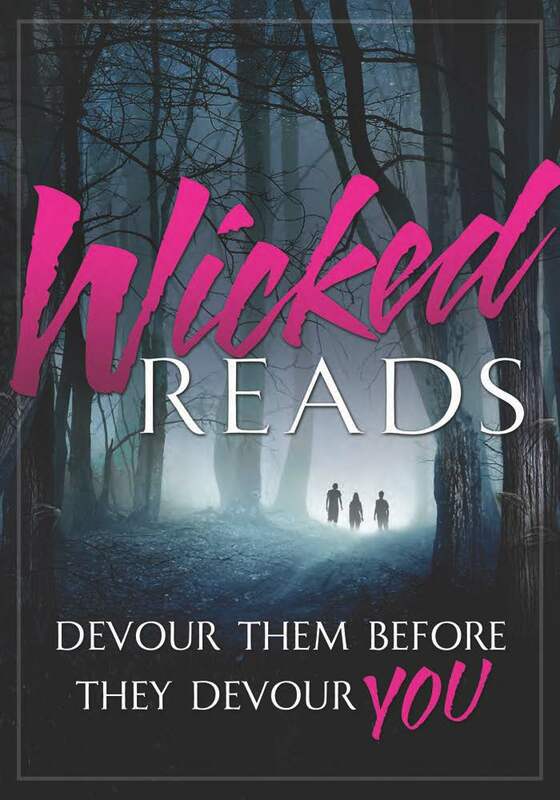 Participants using the hashtag will be entered for the chance to win a prize pack of the featured Wicked Reads titles. There is also still one more #WickedReads Twitter chat left! It’ll be this Friday the 30th at 4pm Eastern with some awesome Wicked Reads authors! Hope to see you there!! That’ll do it for my Wicked Reads recommendations! Have you read any of these? Which books would you recommend for some great Halloween or fall reads? I always love to hear of some more books that are perfect for horror-chickens like me!! This entry was posted in Books, Dystopian, Horror, Review, YA and tagged Books, Dystopian, Horror, Jake Halpern, Nightfall, Peter Kujawinski, Review, YA, Young Adult on October 26, 2015 by Brittany. One of my blog policies is that I will write a review for every single book I finish, no matter what my final opinion was. I’ve been growing a bit more lax with holding myself to reviewing but I still feel the draw to review almost every book, simply because I enjoy sharing my feelings about what I read and how I felt when I read it… but when it came time to review REBEL by Amy Tintera, I was at a total loss for words. REBEL became victim of several unfortunate reading decisions that ended up with a sadly unfortunate overall impression of the book. I read REBOOT back when it first came out — no, before it first came out because I read it as an eARC — back in the spring of 2013. And yes, if you do that math, you’ll see that means that I didn’t get to REBEL until two and a half years later. Sometimes that gap is okay if I’m reading a big, epic fantasy series that I’m already invested in and may not even have the book available to read until a few years later (*cough*A Song of Ice and Fire*cough*) but I really screwed myself and any hopes I may have had of enjoying REBEL as much as I did REBOOT by waiting so long to read it. That’s just too many years to put in between the first and last books of a duology and by the time I read REBEL, not only had I forgotten a ton but my reading tastes had even changed a bit. I knew that I enjoyed REBOOT so I didn’t want to kick REBEL to the curb but I think I lost that prime reading opportunity about a year and a half ago. This is one of the many hardships of being an avid reader and/or book blogger. (First world problems, I know.) There are just so many good books and series out there that it’s just so hard to pick what book I want to read next and perfectly good books/series tend to sit on my shelves while I start new ones. Then I put it off because I’m not in the mood for that genre or I have a book I need to read for a deadline or I need to catch up on ARCs and shove my backlist books to the side. This isn’t the first time this has happened to a series and I’m sure that sadly, it won’t be the last. I tried to get back into REBEL by reading the Recaptains recap of REBOOT and everything sounded familiar all right but that feeling and connection to the characters was close to gone by the time I got to book two. I wanted to enjoy the book as much as I had enjoyed the first and it was really easy to read but that connection just wasn’t there. It could be that I just wasn’t into the book but I think most of it was that I waited too long. This poor, poor book also didn’t stand a chance because it was the last book I read before I picked up QUEEN OF SHADOWS. 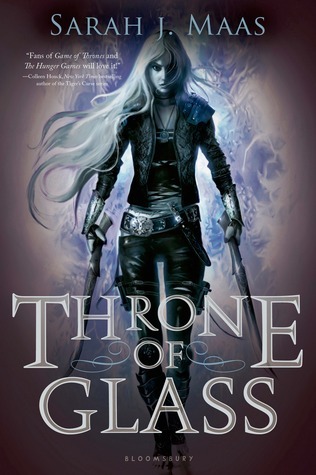 I had the choice to read one more book before starting the latest in this epic fantasy series from Sarah J. Maas or I could just wait patiently and you know, wait. But any time that I could be reading and am NOT feels wasted so I grabbed REBEL off the shelf to try and finally finish this series and put another check mark on the never-ending list of series that I need to complete. Bad, bad move. I started REBEL and then didn’t have enough time to read before QUEEN OF SHADOWS arrived and before you knew it, the precious was in my hands and I was still reading a book all the while staring at this new pretty. So, shame on me, I ended up rushing through REBEL to finish so I could start a different book and continue on in one of my favorite series. That made me feel even more detached and I felt the pressure and was anxiously trying to finish so I could start reading QUEEN OF SHADOWS before the spoilers started hitting Goodreads. Poor, poor REBEL. I tried to come up with some thoughts once I finished and I felt… Ambivalent. The book was okay. The writing was okay. The plot, romance, action, and characters were all okay. And “okay” doesn’t really make for a great review. When it comes down to it, it could have just been a middle-of-the-road book but I also think I did it an injustice by waiting too long to read it and then on the flip side, rushing through it. I know there are cases where a book can be better or worse depending on your mood (*raises hand as a mood reader*) and that a book may be better for you at one time in your life versus another but this is something that I’ll never know! I may have rated it higher had circumstances been different but the fact is that this is how my read went and all I can do is reflect on what I did read and how it made me feel at the time. And there you have the non-review. This entry was posted in Books, Dystopian, Review, YA and tagged Amy Tintera, Books, Discussion, Dystopian, Non-Review, Rebel, Reboot, Review, YA, Young Adult, Zombies on October 2, 2015 by Brittany. I’ve been re-reading The Lunar Chronicles in anticipation of WINTER’s release in November and I’m having the best time! (Pssst check out the Lunar Chronicles (Re)Read Along if you want to join in for CRESS and WINTER!) I’m re-reading each book on audio and I’ll be reading WINTER in print when it comes out and it’s been so much fun reliving one of my favorite series! Since I’ve already done one formal review of SCARLET back when I first read it, I’m switching things up a bit with a bit more feeling and a little less analyzing with “10 Things I Felt About” SCARLET! Cinder returns in the second thrilling installment of the New York Times-bestselling Lunar Chronicles. She's trying to break out of prison—even though if she succeeds, she'll be the Commonwealth's most wanted fugitive. Halfway around the world, Scarlet Benoit's grandmother is missing. It turns out there are many things Scarlet doesn't know about her grandmother and the grave danger she has lived in her whole life. When Scarlet encounters Wolf, a street fighter who may have information as to her grandmother's whereabouts, she has no choice but to trust him, though he clearly has a few dark secrets of his own. CAUTIOUS. I’ve loved all of the books (of course) BUT I remembered that Scarlet was my least favorite heroine and I couldn’t remember why. I was a bit nervous to find out where that feeling came from! FORGETFUL. Ummmm, I forgot a LOT about Scarlet’s story line. I pretty much remembered the train scene and the action at the end haha! Okay, that’s exaggerating — I did remember more than that but everything was super fuzzy so I was excited to sort of re-discover it! DOE-EYED. Oh, hello again, Thorne. How I love you so. WOLF-INCLINED. I forgot how much I really liked Wolf in this book. I’m not sure why he didn’t seem to make a more lasting impression on me during my first read. Possibly because he’s more reserved, closed-off, and less in the spotlight. Wolf’s got a lot more history and secrets than Kai so seeing him as the love interest for Scarlet was a very different experience and I loved his protectiveness! I can’t believe I forgot that. INVOLVED. Another silly thing that I don’t know why I thought it… From my first read, I felt like there was a lot less Cinder in the book but from my re-read, I felt like it was about half Cinder’s story, half Scarlet’s. I think when I read SCARLET for the first time, I wasn’t quite sure what to expect so to lose part of Cinder’s POV was probably more noticeable. Now that I’m more comfortable with the story being split up amongst the heroines, I feel like Cinder was much more prominent in SCARLET! AMUSED. The banter between Cinder and Thorne is delightful. You know I love snarky guys and Thorne is absolutely perfect. Charming and funny — oh yes. Cinder has a sarcastic sense of humor and doesn’t take any of Thorne’s crap so the back and forth between her and Thorne cracks me up! HORRIFED. I forgot how violent some of these scenes actually are!! I’m usually okay with some gore but eeek, it was a bit cringey. Not in a bad way but woo boy, you gets some gory details! AWESTRUCK. I love, love, love how these story lines come together throughout this series. More and more pieces fall into place how these seemingly un-related girls all share pieces of the same story. Marissa Meyer is a master storyteller and the pieces fall into place flawlessly! EXCITED. I think CRESS might be my favorite book of the series so far so finishing SCARLET just made me even more excited to continue on with the series!! I don’t think SCARLET tops CINDER for me but it’s a very small adjustment there — I love all of these books and I adore the stories they tell. This series is so worth the read and re-read! This entry was posted in Books, Dystopian, Review, Sci-Fi, YA and tagged Books, Cinder, Dystopian, Fantasy, Marissa Meyer, Retelling, Retellings, Review, Scarlet, Sci-Fi, Science Fiction, The Lunar Chronicles, YA, Young Adult on September 28, 2015 by Brittany. To Mare Barrow, a 17-year-old Red girl from The Stilts, it looks like nothing will ever change.Mare finds herself working in the Silver Palace, at the center of those she hates the most. She quickly discovers that, despite her red blood, she possesses a deadly power of her own. One that threatens to destroy Silver control. RED QUEEN was a hard book for me to start. At first I was wary of the dystopian feel, then I was afraid of the hype, and then I was afraid of all of the comparisons that popped up as people were reading. The reviews were mixed and my expectations were sort of all over the place… But when I saw that my library had a copy of the audiobook, I thought it would be a great time to start the book and find out for myself! I can’t sugar coat it… the comparison thing was sort of an issue for me too. RED QUEEN sort of felt like a cookie-cutter dystopian with some fantasy elements and I could not stop the comparisons from popping into my head as I was reading. 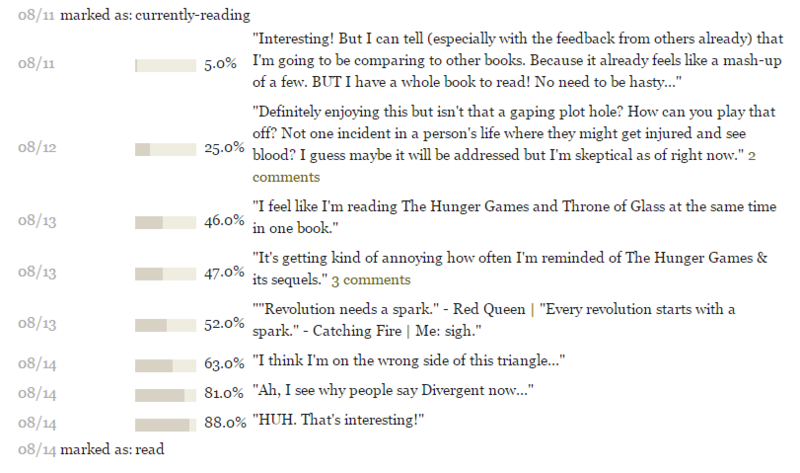 The Hunger Games feel was very prevalent along with Throne of Glass with a little Divergent and Shadow and Bone. I do read so much and have read so many dystopians that it’s not uncommon to be reminded of another book but RED QUEEN felt too similar at times to the point where I could pick out specific settings, scenes, and characters from other books. Now I am not at ALL saying that Victoria Aveyard is ripping any other series off. I think RED QUEEN really fit into that dystopian mold and sometimes that mold is hard to break. For me, RED QUEEN just didn’t quite break out of that formula. I wonder if the fact that is was so similar to these other popular series may have boosted its success with the general population. It’s easily pitchable as that true comparison to The Hunger Games and Divergent and Throne of Glass and readers who are looking for books just like their favorite series will find that comfort within the pages of RED QUEEN. I know when I first finished The Hunger Games, I really was looking for a book very similar to it and I enjoyed so many other dystopians that I picked up afterwards. I appreciated the differences but I kept on hunting for that one book or series just like it so seeing a similarity in RED QUEEN, I think, makes it easy for fans of big blockbuster series really able to identify with this new series while still enjoying a new world and concept and then they’re also able to pass it along to their friends with the same idea in mind. That being said, I actually really did enjoy RED QUEEN from start to finish. I was always engaged, the action and plot were always moving, and I really got to know the characters. Granted, I saw other characters in them and maybe that’s why I felt like I could know them more intimately — I had met someone just like them before — but really, the novel was entertaining from start to finish and I always felt curious, involved, and excited. I think Victoria Aveyard’s writing was really accessible for readers of many audiences and I can see why it’s gotten so much buzz. She really did put together an interesting and action-filled novel. I didn’t have issues with the romance but it was kind of all over the place for me. Not always in a bad way… but it’s sort of triangle-y… but not really, but it is, but it’s not? (HA have fun with that description if you haven’t read the book yet. If you have, you may understand.) I was never quite sure which side I was “supposed” to be on and actually now that I’m finished, I really still not sure. The only issue that I really had was that towards the end, it seemed like Mare had an extreme reaction to one guy and then totally kind of forgot about it once things started changing. I understand that the situation changed and she was seeing someone in a different light but her feelings were strong and I think it’s hard to switch to the opposite spectrum after that. Even if it is a realistic reaction, it was hard for me as a reader to forget. Because of the constant reminders of other series, I was ready for a vanilla ending or something that I saw coming but I was actually pleasantly surprised at how the book wrapped up! The ending actually really did take me by surprise and I was kind of hooked for the last 20% or so. I honestly wasn’t sure how it was going to end and what that ending would mean for these characters. Some things that happened I really did see coming but there’s a sort of major conclusion that happens that I was like, “HUH. Okay then! This is what I needed out of this book.” Of course by that time I was ready to for a different ending so it did boost my feelings towards the book but it was almost too little too late to really hook me or wow me. Long story ermmm, even longer, I did enjoy RED QUEEN from start to finish. I had issues with how cookie-cutter it seemed but the writing really was engaging and the story kept me interested the whole time. The elements I had issues with weren’t anything more specific than the ghosts of YA books past (no issues with world-building or characters which THOSE are the things that really tend to leave me with a sour taste in my mouth) so I guess I leave this book with more of a positive feeling! I was honestly iffy if I was going to read the rest of the series when I was halfway through but knowing the ending, I do want to see where it goes. I’m also interested to see if this starts to break the mold a bit more in book two. Clearly Victoria Aveyard has plans and I found myself curious to see where those plans lead! I’m definitely interested in more of this story but I’m not sure it’ll be an urgent read for me. I actually really enjoyed this audiobook! The book was narrated by Amanda Dolan and this is the first book I’ve listened to of hers but I hope it’s not the last! I really enjoyed her narration and thought she did a great job of portraying each character not only in different voices but also different personalities. I had no issues with the phrasing of things as I sometimes do and I really enjoyed her overall performance. I think she was an excellent choice for this book with Mare as the main character! She really did a great job with her especially. Mare // Character Obsessions: Family, stealing, self-preservation. I really liked Mare! She reminded me of some of my favorite strong heroines (Katniss, Celaena, Alina) and she had that same sort of attitude that all of those girls did too. Sometimes it’s too much for me to watch a scared or weak heroine so I’m always drawn to the strong, sassy ones! Cal // Character Obsessions: Duty, strength, family. I was really all over the place about Cal… but I guess so was Mare! It was so hard to pin him down and figure out what he was really all about… But I ended up liking him a lot throughout the book! There were some pieces of him that ended up being a little rougher and Mare was very turned off by some things but I kind of liked that the book didn’t shy away from the fact that not everyone is all good. Kept Me Hooked On: Dystopian. I started my YA reading habits with almost all dystopian and I sort of burned myself out on the genre so I’m really glad that RED QUEEN made it exciting again! Left Me Wanting More: Originality. I just can’t get over how much of other books I saw in RED QUEEN. That did instantly give it a defined feel and I felt like I knew the characters well already but I couldn’t shake it and sometimes it got on my nerves. I don’t think it was intentional on Aveyard’s part but I think it just fit really well with what I expect from a dystopian novel. I am excited to see where the second book goes though. I actually really enjoyed RED QUEEN. I didn’t fall in love with it like some did but I was wholly entertained from start to finish. This entry was posted in Books, Dystopian, Fantasy, Review, YA and tagged Books, Dystopian, Fantasy, Red Queen, Red Queen Trilogy, Review, Victoria Aveyard, YA, Young Adult on September 4, 2015 by Brittany. I’m sure by now you know that The Lunar Chronicles is one of my all-time favorite series out there. I’ve grown obsessed over the years and yet somehow, I hadn’t re-read any of the books. With Winter coming out this November and bringing the series to a close, I knew I wanted to stack up some re-reads back to back to back to refresh my memory of the details of the series and also just to enjoy the books all over again. I’ve already done one formal review of CINDER back when I first picked up the series in January 2013 so I thought I’d compile a mini-review with some more feeling-related thoughts since you can see my initial review for my first reactions! FAMILIAR. I loved starting this re-read and totally falling back into this world. It’s always so wonderful to revisit a world that I love so much and it was really fantastic to have that feeling again! FRESH. Despite the fact that I’ve read this book before, it still felt like a very fresh tale to me. It’s been more than two years since I actually read CINDER so it was really fun to start the series over from the beginning! It was nice to rediscover all of these things again. IN-THE-KNOW. Of course I already knew the big surprises scattered throughout the book so they didn’t seem as epic to me… But it was really neat to read the book already knowing what they were! It allowed me to pick up on things that I hadn’t seen on my first go around. IMAGINITIVE. My mind wandered a bit more while I was listening (I read the book on audio) because I was already familiar with the world-building and the characters. I think I got to dig deeper into everything and let connections form and ideas expand! SASSY. I don’t remember Cinder being such a sassy and sarcastic character! Maybe I didn’t read her voice in that tone when I was reading the print version but… I kind of liked it! Rebecca Soler narrates the audiobooks and she was just fantastic! I’m really excited to listen to her portrayal of other characters. SWOONY. I’ll admit that Cinder and Kai were my least favorite couple throughout the series but I finally got into their romance in CRESS. Re-reading CINDER? I don’t know why it took me so long! Did the narrator really bring everything to life that much more? Is it because I already know about their relationship and I finally got to the point of swoons? Whichever way you slice it, I really got into their romance on my re-read! They seemed to have so much more chemistry than I initially felt!! EXCITED. I still love all of the action that takes place here! Cinder is a fantastic heroine and I love her attitude and determination. She loves her family (well, the family that treats her well) fiercely and she will stop at nothing to help and protect them… which creates some very high-tension moments! AMAZED. I still love how this story comes together and everything it sets up for the rest of the books. Knowing what I learned from SCARLET and CRESS really allowed me more insight and I love seeing how much of those books are already established in CINDER but it’s hard to see until you read them. The layers are really fantastic and I’m constantly impressed with Marissa Meyer’s writing! Let’s all let out a huge sigh of relief that CINDER was just as wonderful as when I first read it. WHEWWWW. Okay! (Not that I really doubted it that much but you know.) This series is just so well done and it’s one of the few that I’m SUPER impressed with as far as plotting goes. There are so many elements that have been established from the beginning and the sequels aren’t just extra books — they’re really extra layers, exposing secrets that were there from the start and expanding on current plots. This entry was posted in Books, Dystopian, Review, Sci-Fi, YA and tagged Books, Cinder, Dystopian, Fantasy, Marissa Meyer, Retelling, Retellings, Review, Sci-Fi, Science Fiction, The Lunar Chronicles, YA, Young Adult on June 16, 2015 by Brittany.